Q: ROK National Security Adviser Chung Eui-yong has reportedly arrived in Beijing today. He will brief the Chinese leaders on his visits to the DPRK and the US. What is your expectation for his China visit? A: You are right that Special Envoy of the ROK President and National Security Adviser Chung Eui-yong is in China today. As his visit is still unfolding, we will timely release relevant information when we have it. Q: The Global Times reported today that a delegation of Chinese health officials will be visiting the Vatican for a conference on organ transplant. China attended one last year as well. Do you have any information on that and whether or not it is connected with the improving relationship between China and the Vatican? A: I can check after the press briefing whether it is the case that a Chinese delegation is going to attend that meeting as you mentioned. If that is true, it is not the first time that a Chinese health delegation attended such a meeting. As for whether it has anything to do with the improvement of China-Vatican ties, I believe you know very well that it is rare to discuss diplomatic ties via health channels. China's principled position on developing China-Vatican relations is clear enough. I will not repeat it here. We hope and look forward to seeing that China and the Vatican could improve bilateral ties by working towards the same direction. Q: According to reports, on March 5, Kazakh President Nursultan Nazarbayev proposed Five Social Initiatives. What is your comment? How do you envision the future of China-Kazakhstan relations? A: China and Kazakhstan are friendly neighbors and comprehensive strategic partners. Under the strategic guidance of President Xi Jinping and President Nazarbayev, China and Kazakhstan have in recent years conducted exchanges and experience-sharing activities on state governance, which have yielded fruitful outcomes. Our two countries all regard improving people's livelihood as the priority of development goals. China firmly supports the policy measures and initiatives for better livelihood proposed by the Kazakh leader, and sincerely hopes that Kazakhstan will make new progress in its national development. As to the prospect of China-Kazakhstan relations, the China-Kazakhstan relationship operating at a high level is an exemplar of friendship between China and its neighbors. We are satisfied with the development of such bilateral relations. We believe that under the strategic guidance of the two heads of state and with the concerted efforts of all walks of life in China and Kazakhstan, the China-Kazakhstan relationship will score even greater success in the future. 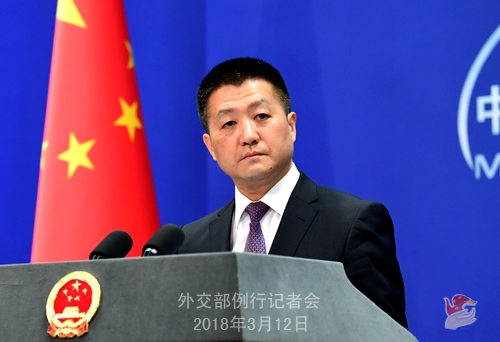 Q: Recently, the Spokesperson of the Indian Ministry of External Affairs said that relations between India and China are not just important bilaterally, but also have regional and global significance. He also mentioned that India is willing to work with the Chinese side to develop bilateral relations based on commonalities, while dealing with differences on the basis of mutual respect and sensitivity to each other's interests, concerns and aspirations. What is your comment on that? A: We have noted these positive remarks made by the Indian side. 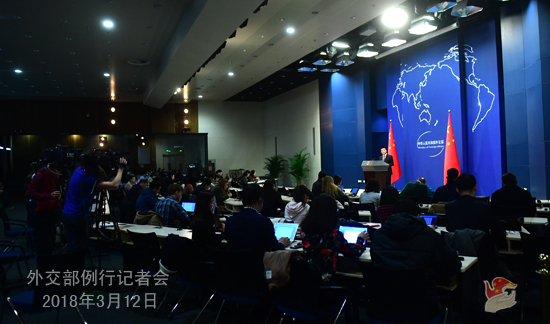 You may also noted that Foreign Minister Wang Yi at his press conference on March 8, talked about China's perspective on China-India ties as well as its basic stance on developing China-India relations. 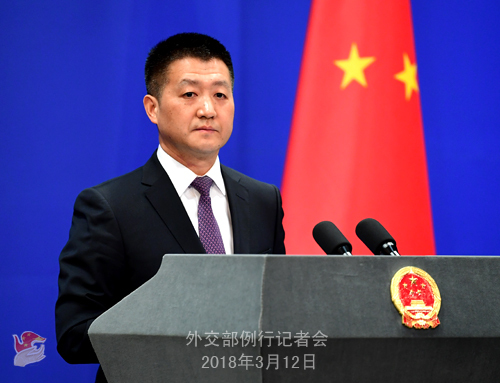 We stand ready to work with the Indian side, under the guidance of the important consensus reached by our leaders, to enhance political mutual trust, promote mutually beneficial cooperation, properly handle differences so as to ensure China-India relations move forward steadily along the right track. Q: Regarding the future meeting between the DPRK and the US leaders, has the DPRK side informed the Chinese side of anything? A: These positive signs that have recently emerged in the Korean Peninsula situation are holding the attention of the international community. My colleagues have talked about China's viewpoints and proposals many times. I can tell you, for sure, that China remains in close communication with relevant parties on realizing a turn-around in the Korean Peninsula situation and bringing the Korean Peninsula nuclear issue back to the right track of political settlement through dialogue and consultation. Q: According to the Guardian, the Philippine Department of Justice last month listed more than 600 people it wanted to be categorized as rebels for "using acts of terror" to undermine the government. Among them was the UN Special Rapporteur on Human Rights Victoria Tauli-Corpuz. The UN High Commissioner for Human Rights, Zeid Ra'ad Al Hussein, said in response that President Duterte needs to submit himself to some sort of psychiatric examination. What is your comment? A: Anyone without bias can see that President Duterte has made positive efforts since assuming office to combat drug-related crimes as well as terrorism, develop the national economy, and improve people's livelihood, which have effectively protected and promoted the Philippine people's fundamental rights to security and development. The achievements made by the Philippine government led by President Duterte on these fronts have won great approval and extensive support among the Philippine people. Relevant sides of the international community, including the Office of the United Nations High Commissioner for Human Rights, shall respect the sovereignty of the Philippines and the will of its people, view the outcomes of the Philippines' fight against drug and terrorism in a comprehensive, unbiased and objective way, and support its efforts to move forward its human rights cause in light of its national conditions. As an agency of the UN, the Office of the United Nations High Commissioner for Human Rights is expected to fulfill its duties within the framework set out by the purposes and principles of the UN Charter.